Just a quick plug. I have found this book to be extremely helpful in my creation of my WordPress blogs. Of course I haven’t read it cover-to-cover, but I have consulted it on several occasions, reading the parts that were relevant to me. 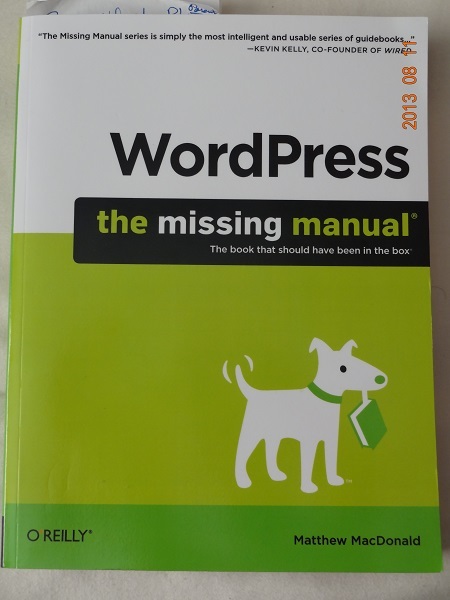 I am using the WordPress site to host my blogs, so I cannot comment on whether or not this book would be useful for others with their own hosted-site. Like all types of manuals, I have found some of the information dated. The copyright is 2012, but I assume the people behind WordPress have been tweaking their product. For example, the editing of a gallery has changed. According to MacDonald, by clicking on the box in the Post visual tab will not allow you to open and edit an existing gallery. When I clicked on the box, two icons in the upper left of the box appeared. Clicking on the first one opened the gallery I created so that I could edit it. It’s hard to keep manuals up-to-date, but overall I found the information in WordPress to be very helpful. I went from knowing virtually nothing about WordPress to feeling much more confidant as I post and tweak my blogs to make them what I want. I just started a blog back in February to document my 3 months in Greece, and I knew virtually nothing about the site. Now I know much more. I bought my copy, but this title should be available in your local public library.